Abundant snowfall has impaired the ability of many would-be consumers to visit the region deferring purchasing decisions to spring. This may cause a slower than usual March; a time when winter sales often find their greatest stride before a shoulder season lull. Regardless, large snowfall typically casts a prominent light on slopeside real estate. Northstar currently shows 6 properties pending sale including 3 in the Mountainside neighborhood. Squaw Valley and Alpine Meadows add 5 and 2 pending sales respectively. With a long spring assured, ample time will exist for spring skiing and real estate tours alike. Year-to-date, the 2019 market correction has been a gentle one for the Tahoe-Truckee region. 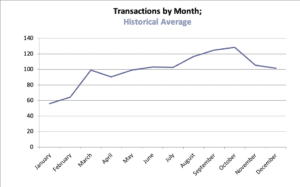 The total number of transactions has been almost identical to the same period in 2018 despite enduring polar opposite winter conditions. Similarly, median price is within .6% of the same period last year while inventory remains modest at 3.5 months’ supply. Notable among transactions recorded in February 2019 is the geographic distribution, or lack thereof, when compared to last February. 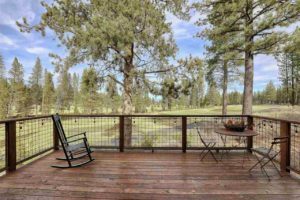 2019 premium transactions include homes in Martis Camp (4; $3,999,535 – $6,700,000), Lahontan (4; $2,250,000 – $4,750,000), Northstar (2; $1,870,000 – $2,935,000) plus Squaw Valley, Tahoe Donner and other residential areas of Truckee. Lakeside homes are not represented above $1 million but for a single transaction, the 15thlargest in the region for the month. While it is not uncommon for lakeside interest to peak in summer months, the extremity of this data set is remarkable. In contract, last February saw 9 transactions greater than $1 million in lakeside communities contrasted by 3 in Northstar, and one in each of Lahontan, Martis Camp, Tahoe Donner and Alpine Meadows. The chart below shows the ratio of sales in Truckee based communities versus those in the Tahoe Basin (California; North and West Shores). 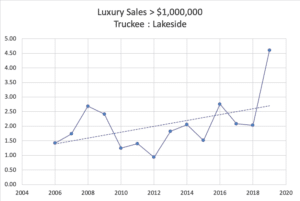 While more product exists in Truckee, the chart shows a strong progression toward premium purchases in newer communities. This phenomenon is the continuation of a gradual evolution whereby newer, highly amenitized communities are valued at a significant premium over dated, though classically designed, Tahoe product. In addition to contemporary homes, the explosion in popularity of jet travel to and from the Truckee airport has been a boon for those communities most proximate including Martis Camp, Lahontan, Schaffers Mill, Northstar, Old Greenwood and Gray’s Crossing. I hope to see you up enjoying the ski slopes this weekend. Don’t hesitate to call if you or any friends would like to view properties. I appreciate your referrals!